These knob sets are hand customized in our shop. 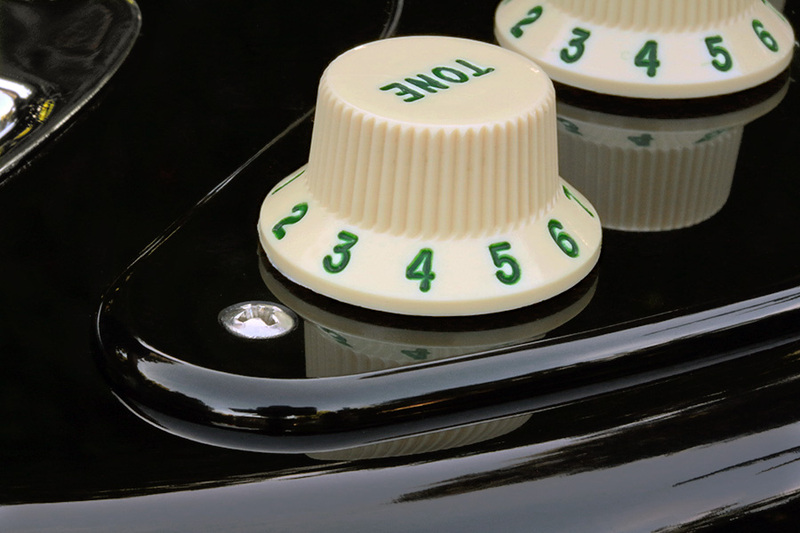 The featured knob set is what we call the Vintage '62 style that has the dark green letters and numbers. We also offer a number of alternate letter and number colors to appeal to the most unique Strat® color themes. With old or vintage knobs from many years ago this green coloration of the letters and numbers is the result of natural aging or oxidation effect of the original gold coloring that would change color with age, the gold would patina naturally to a dark green color. However, the gold lettering in modern production knobs will no longer naturally oxidize to this green color with time, the gold lettering will stay gold forever. Our reproductions offered here are a simulation of the natural oxidation effect of the old or vintage knobs. 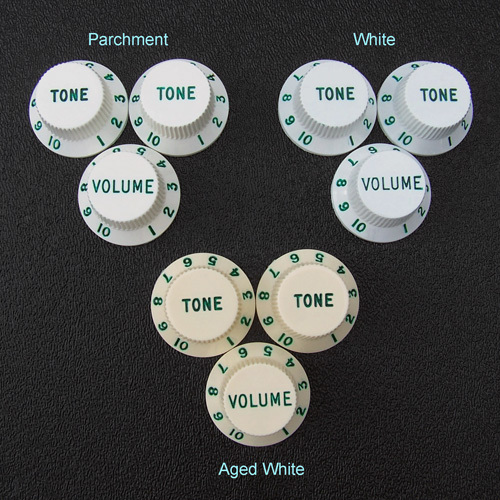 Each of these knob sets are Brand New, Current Production Genuine Fender® volume and tone knobs that have the original color lettering and numbering removed and replaced with your choice of colors. Give us up to 21 days to customize this knob set for you. The plastic knob colors are available in White, Parchment and Aged White. Each knob set includes three knobs; one Volume and two Tone knobs. Shown above is the Vintage '62 style dark green letters and numbers.
. Green Teal Light Blue Dark Blue Red Magenta Orange Black . Due to characteristic inconsistencies in the molding process of these knob sets as Fender® is having them manufactured, often we find small flaws in the surface, usually around the skirt and most often adjacent to the letters or numbers as depicted above. These flaws are very small indentations or very small curly grooves in which the replacement color has a tendency to settle into and is very difficult if not impossible to be removed. So it is possible you may notice these small color blemishes next to some of the letters or numbers and it is simply a characteristic of the knobs and is not something we can work around, but we do our best to minimize the effect. Even as the knobs originally come from Fender® with the gold lettering and numbering these imperfections are filled with the gold color as well, but since the gold color is not dark like the replacement color so there is very little contrast between the knob color and the gold, so it essentially goes unnoticed. If you happen to notice some of these characteristics in your particular knob set, take a close look at these areas with a magnifying glass and you’ll see exactly why the replacement color can’t be removed from these small recessed areas. Even in the Fender® Custom Shop RELIC Gilmour Black Strat® these characteristics are present. These knob sets are customized specifically for each customer and do not qualify for return, exchange or refund.